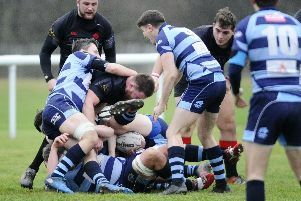 After a week’s break for the cup, Grangemouth Stags returned to league action on Saturday with a win across the Clacks Bridge at Alloa. The pitch was soft the tricky conditions were reflected in handling errors by both sides in the opening exchanges. However Alloa looked sharper and opened the scoring after five minutes, bursting through from a set scrum to score under the posts. The conversion was on target. Grangemouth slowly worked their way into the game and tied the scores after 15 minutes. Allan’s angled run cut the defensive line before he outpaced the full-back for a fine individual score, converted by Skelton. Allan scored again after 25 minutes, collecting a scoring pass after a recycled ball and running in close to the posts. Skelton again added the extras, but numerous penalties given away by the visitors allowed Alloa to pin them in their own 22 and led to the winger sliding in at the corner. The conversion was wide, leaving Stags 14-12 ahead at the break. Grangemouth upped the tempo at the start of the second half and Forsyth took a quick tap to scamper 15 metres before passing to substitute McNab who galloped in from the 22 for the score. Skelton was again on target with the conversion. 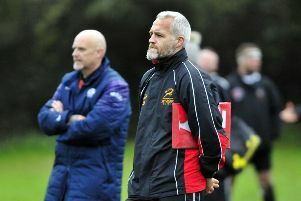 Alloa narrowed the gap when their scrum-half took a quick tap penalty five metres from the line to dive over for an unconverted score and as the game entered the final quarter, they scored again as the winger squeezed in at the corner. Again the conversion was wide but Alloa now led 22-21. However Grangemouth responded and retook the lead with just seven minutes remaining. Forsyth darted upfield and passed to McNiff who carried on into the 22. The ball was quickly recycled and Skelton skipped past his man to run in under the posts before converting his own score. The closing five minutes saw Alloa lay siege to the Stags line, but they held firm. This Saturday Stags welcome Ellon to Glensburgh for their last league fixture of the year, kick-off 2pm.